Merillat recently introduced yet another new storage solution at IBS 2011, the CornerStore corner access cabinets. An alternative to traditional Lazy Susans, the CornerStore cabinets turn otherwise unused corner cabinet areas into additional storage space. The drawers are positioned in the center, offering two drawer sizes for flexible storage. Two pull-out pantry trays flank either side of the drawers, and each has an adjustable center shelf to accommodate whatever items you choose to store in them, from dishes to cookware, to dry good, to even small appliances! Merillat has many organization solutions available, with many cabinet features and accessories to help you organize any room in your house. Check out the Merillat cabinet accessories page to see what Merillat cabinets can do to help you organize your home and your life. 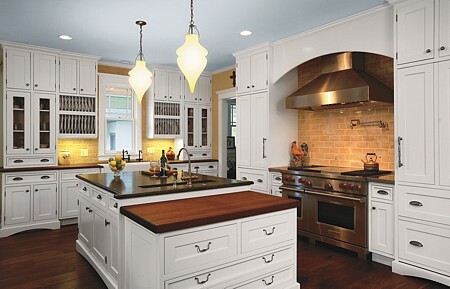 Call 1-508-DESIGNS(337-4467) to reach a Kitchen Views designer who will help you to organize every area of your home. There are plenty of new things going on with Crystal Cabinets, one of our favorite cabinet brands. Kitchen Views carries both custom and semi-custom lines of Crystal Cabinets, a company known for their strong environmental ethics. Our offerings include Crystal’s GreenQuest line of frameless, environmentally-friendly cabinetry, which qualify for points in LEED certification. We also design with and sell their more affordable semi-custom line which also features the same green construction and finishes of their custom lines. You can learn more about LuxGuard and other new product line innovations by Crystal Cabinets on their What’s New page. 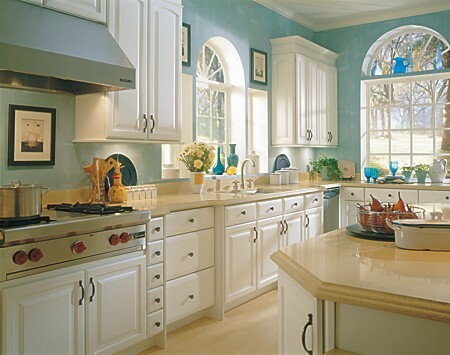 Visit a Kitchen Views showroom near you to learn more about Crystal Cabinets. Most people may not realize this, but often the ceilings in their homes are not flat. They could be slightly sloped, have high and low spots or a combination of all of these. This condition can be created as a house settles as it ages or the ceiling may have been made uneven to start with. Rolling or uneven ceilings go mostly unnoticed because light usually shines down in a room and does not highlight the flaws in a ceiling. Uneven ceilings can create issues in kitchens when it comes to crown or other mouldings that finish out the tops of cabinets. Properly installed cabinets are flat and level. If the ceiling above the cabinets is not flat and level, crown moulding will touch the ceiling at one point and have significant gaps at others. Caulking the seam between the moulding and the ceiling is not advisable since the gap between the ceiling and molding will swell and shrink with the seasons and the caulk line will open up over time. The two best solutions for dealing with this are having the crown moulding not extend all the way to the ceiling or using flat stock above the cabinets. Stopping the moulding below the ceiling may not be as attractive as crown moulding that fills all the space above the cabinets, but it is an improvement over unsightly gaps. Using flat stock as a moulding gives the installer the ability to scribe (cut away) portions of the moulding and bring it all the way to the ceiling. The flat face of the moulding still looks clean and attractive even if some of in needs to be cut down. Typical crown moulding has too much detail to trim part of it away without affecting the appearance. Finding out if a ceiling has issues early in the design process can help address and solve problems before they become a major problem. Working with the Kitchen Views Design Team provides you with a well-trained person trouble-shooting your particular situation and making the process go smoothly. When you are installing new kitchen cabinets, do not forget about the underside of the wall cabinets. In most cases, a piece of moulding is installed along the bottom edge of the cabinet frame, either for decoration or as a light rail to conceal the light fixtures, but this does not cover the seams and box construction of cabinets (see picture below). However, if there is a seating area such as a table, island or peninsula, the underside of the wall cabinet box construction is visible and not attractive to view. Below are several solutions that may be used on both framed and frameless cabinets. 1. Place ¾ matching finished solid stock – the depth of the wall cabinet box (one face and edge finished) and attach to bottom of cabinet with blind nails. 2. Place a ¾ matching solid stock ¾ to 1 ½’ deeper than cabinet box (finished both faces and one long edge) with profiled edge of choice and attach to box as above. 3. 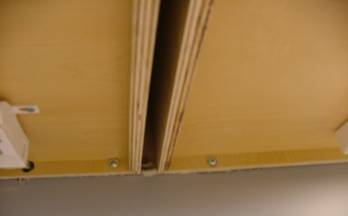 A ¼ matching plywood panel and light rail moulding are applied to the bottom in either of the two methods as illustrated below. All of the above could be used with under cabinet lighting, but the lighting would be completely or partially proud (beyond) of the bottom of the cabinet box. Or, if puck lighting is used, the electrician could recess the fixture in the panel if it is a framed cabinet installation. For a complete diagram of the finished undersides available from Omega Cabinets, visit this PDF on our website. 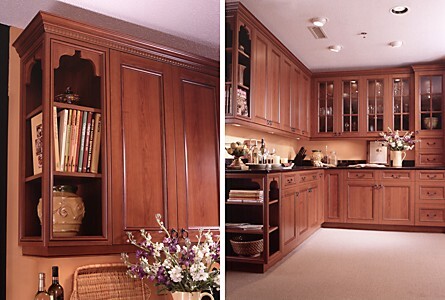 To learn more about the many different options for wall cabinets, contact your nearest Kitchen Views showroom. Plywood, along with Furniture Board, is the most common of the materials used in the manufacture of a cabinet box. It is made by taking overlapping layers of wood veneers and glue and pressing them into sheets. The end product is comparatively light, very strong and long lasting. Plywood costs more than furniture board and can add to the price of a cabinet but it is still a very desirable product for cabinet construction. Furniture Board is a modernized version of particle board. It is denser and made at higher pressure with better glues than its older cousin. Whereas particle board would have issues of swelling when exposed to moisture, the newer furniture board is stronger and more resistant to moisture. I was skeptical when I was initially told this by one of our sales reps. He stated that furniture board could survive direct contact with moisture without failing. I took a shelf from one of our displays and submerged it in my bathtub overnight. The next day the shelf was fine and once it dried out it went back into our display. Naturally, do not try this with your cabinets, but it does illustrate how far the material has come. Some manufacturers will offer cabinet boxes that are made of solid wood. These are staves that have been glued up into panels and made into the sides, tops and bottoms of cabinets. This is not used as much because of the large amount of hardwood lumber it consumes and because of issues with cabinet stability. Solid hardwood still expands and contracts depending on the ambient humidity. A side panel on a base cabinet is 24 inches wide and can grow 3/8” to ½” in higher humidity and shrink the same amount in dry climes. Medium Density Fiberboard (MDF), while an excellent material for wood and thermofoil laminate cabinet doors and center panels on painted doors, does not lend itself well to cabinet construction. It is considerably heavier than plywood, furniture board and hardwood. It also does not hold fasteners as well as the above materials. As a result, it is not offered as a material for cabinet boxes. Because they are both materials manufactured from wood residuals, MDF and Furniture Board are often confused with one another. The vast majority of cabinets for the home are made from Furniture Board and Plywood. Each cabinet company manufactures their product with material that best meets their structural and budgetary specifications. Knowing the materials that make up cabinets will assist in making the best decisions for your design project.